Why shouldn’t I take my next adventure to china? I was on facebook when this video popped up; I didn’t know what the video was all about but I clicked on it to see the content. When the video was playing, I didn’t understand what they were saying but I was marveled at what I was. The video was a little lengthy and my network was bad but I had to watch it until the end. After watching the video I went to read comment, perhaps peoples comment will tell me more about the place in the video but it seemed almost everybody was lost, some of the comment that might have given me a clue of what I was looking for where all in Chinese alphabet which I didn’t understand. Some people were saying the video wasn’t real while some where saying it a Hindu temple, the closes clue to what I was looking for was that the mountain and the temple were in china. Well, sincerely that was one of the most amazing and astonishing thing I have ever seen, the sites in the video was just breathtaking, but I didn’t understand why people were saying it not real because it looked real to me. Since I couldn’t find the answer to what I was looking for in the comment my curiosity took me to Google where I got 80% of the answer I was looking for. First, I came across Mount Jiuhua. Mount Jiuhua is one of five Buddhist Mountains in China, and it is the country first national scenic spot. It is located in the southeast of Chizhou city, Anhui province. It is across from Tianzhu Mountain with Yangtze River separated in its northwest. Mount Jiuhua has an area of 120 square kilometers; the protection area is 174 square kilometers. Mount Jiuhua is a fresh and natural landscape drawing. There are many types of scenery in Mount Jiuhua. After being open to the public, Mount Jiuhua added eight scenic regions, hundreds of new attractions. A World Heritage Site listed by UNESCO. It is the most sacred Taoist mountain and of historical and cultural significance in China. The word “tai” in Chinese means stability and peace and the name Tai’an is attributed to the saying: “If Mount Tai is stable, so is the entire country”. Many ancient Chinese emperors performed mountain worship ceremonies on Mount Tai. It is said to be the first and foremost thing for emperors to do when they ascend to the throne, because Mount Tai is seen as the symbol of the county’s peace and prosperity. After seeing the picture of both mount juidua and mount tai I had no other option than to believe that the video are from both mountains but they were places in that video that I didn’t see in any of mount juidua and tai until I saw pictures of Tianzi Mountain. It was after I saw Tianzi Mountain that I came to the conclusion that the video was of the three mountain. 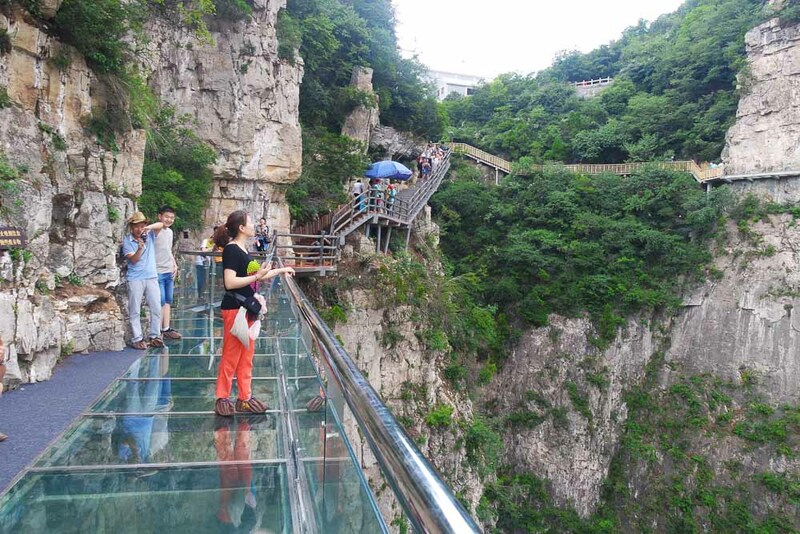 With places like Tianzi Mountain, mount juidua, mount tai, Mount Hua, Tianmen Mountain, Zhangjiajie Glass Bridge, The Zhangjiajie National Forest Park and a whole lot of other interesting and amazing places in chine, why won’t my next adventure take me to china? And for fellow adventure seekers, why shouldn’t china be in your bucket list? I could not believe how they would have constructed them. It’s so amazing. Kinda reminded me of Meteora in Greece too! nice place to visit but i will skip this in my list as i am super afraid of height! nevertheless, thanks for your sharing! that second last picture is amazing! super tall and long way down … i feel dizzy from just looking at your photos. Sometimes I really wonder how do they actually do it? Their architecture level is massive! Definitely in my bucket list after reading this post! Thanks for sharing! This is absolutely beautiful. I am definitely putting it on my bucket list! Wow, these look great and would love to visit them one day, even though I’m scared of heights! China has so much to offer! Most people have never heard of this, but it is certainly worth seeing and the pics look great! Wow, these look amazing but also a little terrifying. These are so cool! I spent this past July in China, and it is beautiful. My boyfriend is an international student from China so he took me to most of the major cities and also to the small town where he is from. I thought I saw a lot, but I didn’t see any of these. I’m sure I will be taking many more trips to China in the future, and these places are definitely making it on my bucket list. Wow it looks AMAZING! I really need to add this to my bucket list. I would love to go in the cable car and enjoy the nice view. amazing photos and scenery of the nature. Wow… those picture are so amazing. am just imagining how those building on top of those mountain were constructed. Oh wow. I have always wanted to visit China. I guess I’ll have to get over my slight fear of heights! Very interesting article and very nice pictures!